'Love is all that matters, faithful and forever,' a perfect lyrics quote for the world's tallest man (8 ft 3 in) Sultan Kosen who was happily married to a Syrian woman in Turkey. Sultan Kosen, 31-year old groom said that he was the 'happiest man in the world,' during his wedding ceremony together with his 20-year old Syrian bride Mervi Dibo in southeastern province of Mardin on Sunday. He said, "I cannot describe my feelings in words." Kosen became famous after being tag as 'World's tallest man' in the world, the Guinness World Records declared in September 2009. For the meantime, please bookmark this page now or visit this site more often for you to be updated. You may also share this post to your friends so they may know about World's Tallest Man who was married to a Syrian woman. 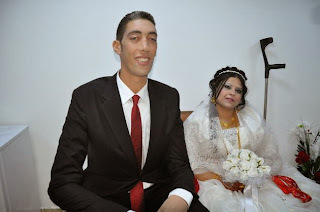 Comments or suggestions about "World's Tallest Man Married to a Syrian woman" is important to us, you may share it by using the comment box below.